Next Meeting – Bring It ON! Bring out your pots! Or any garden related item (book, vases, tools, etc.) that you want to swap at the next meeting! NO Soil, Cheapo Plastic Nursery Pots, Chemicals! This is a classy event. Leftovers will be donated to the Swap Shop of Betsy’s choice. Brought to you by the Environment & Conservation Committee. Last Friday was P. Allen Smith Day hosted by Churchills. Every year they sponsor a trip to Pleasant View Gardens in Loudon, NH where plants are grown for the Proven Winners brand. I know we are all familiar with their beautiful blooms at garden centers. Various growers around the country produce Proven Winners. This facility specializes in annuals. 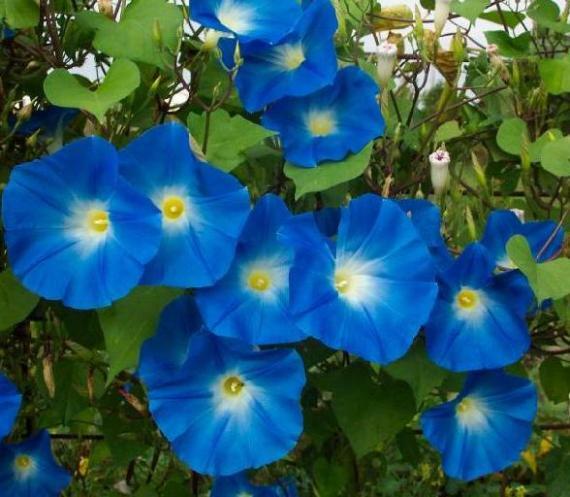 Morning Glories, while quite pretty, are very aggressive climbers so you need to be careful where you plant them in your garden. They will climb over anything and everything, if you know what I mean.